The Zimbabwe Republic Police (ZRP) has released a relaxed festive season roadblock schedule which establishes police checkpoints at least 100 kilometres apart on national trunk roads as part of the force’s efforts to improve its battered public image. The news is likely to be received with joy by long distance travellers who have in recent years been subjected to police harassment on the roads. Previously, travellers had to endure heavy police presences on the roads during this period of the year, with most of the roadblocks stuffed by bribe-taking cops. The roadblocks would be haphazardly located and in some instances, a distance of just ten kilometres would have three or four road blocks. 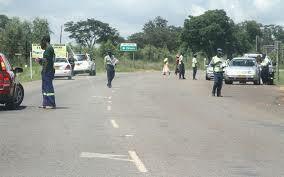 According to the schedule released by the ZRP traffic section on Friday, only four road blocks have been established along the Harare-Mutare highway, a distance spanning 266km. The roadblocks are located at Mabvuku, just outside Harare, Marondera, Rusape and at Penhalonga turn-off near Mutare. Previously, this road would have road blocks dotted all over in addition to occasional police highway patrols. One of the most heavily policed highways, the Harare-Masvingo road which used to have no less than ten roadblocks, now also has four roadblocks located at Beatrice, Featherstone, Chaka turn-off and at the 282km peg near Masvingo. The total length of the road is 295km. Three roadblocks have now been established on the road which proceeds from Masvingo to Beitbridge, one at Nyanda area just outside Masvingo City, another at Rutenga and the other one is at the 318km peg going into Beitbridge. Six roadblocks have been established along the 435km Harare-Bulawayo highway. They are at Norton, Chegutu, Kadoma, Kwekwe, Gweru, Mbembesi and one is located just outside Bulawayo City. The tourist laden Bulawayo-Victoria Falls road now has roadblocks at Nyamandlovu, Lupane, Hwange and near the Victoria Falls International Airport. Roadblocks along the Harare-Chirundu highway have been located at Chinhoyi, Karoi and Makuti, while the 89km Harare-Bindura highway now only has one roadblock located at Mazowe. National traffic police spokesperson Tigere Chigome urged drivers to desist from taking advantage of the reduced road blocks to break the rules of the road. “We urge drivers not to take advantage of the spacious roadblocks to speed and overload their vehicles. Let’s maintain the speed limits to void unnecessary accidents, loss of life and injuries. Let’s us be responsible and follow all the rules of the road,” he said. The ZRP is currently undergoing surgical operational changes following the change of government in November and the subsequent forced resignation of former ZRP commissioner general, Augustine Chihuri. Only on Wednesday, acting police chief Godwin Matanga publicly apologised for the police conduct of recent years and pledged to reform the force into a respectable, authoritative law enforcement agent free from corruption and other vices. There has also been an outcry from players in the tourism sector, who argued that the heavy police presence on the roads was chasing away tourists, while the motoring public was subjected to harassment from arrogant cops who would throw spikes at moving vehicles to rapture tyres and effect arrests or smash windscreens to stop fleeing drivers.